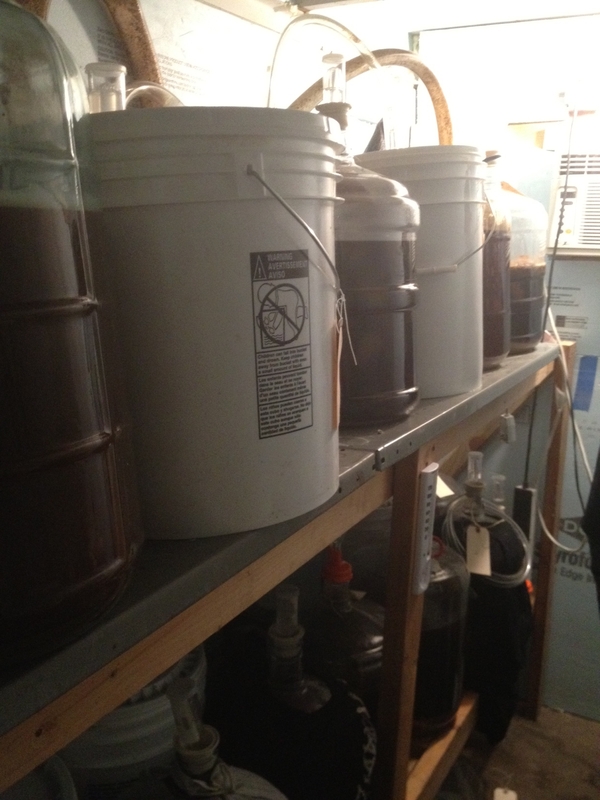 I have written a few times about Chicago Homebrew Alchemists of Sud (CHAOS) Brew Club over the year. It’s not that I have anything against any of the other Chicago area homebrew clubs; quite the contrary. I am in full support of any and all entities that promote the art of craft beer and brewing. But I am a member of CHAOS and have the most experience with this club so it gets the majority of my attention. What makes CHAOS unique from the other clubs, though, is that we have a community brew house where you can leave your homebrewing equipment at the brew house, or use the equipment that is already available, and brew on the premises. This is especially helpful for those of us that live in Chicago apartments with tiny kitchens that are not conducive to brewing (I am definitely not getting my security deposit back…). Even though the luxury of a brew house has been available to me for a while, the hubby and I continue to brew in said tiny kitchen. Well, that changed on Saturday when we decided to take the brew house for a spin. On Saturday, February 11, 2012, CHAOS had an event entitled Brew and Chill Day. CHAOS aims to have an Open House once a month to allow interested potential members to come out and see the brew house. For February’s event, we decided to take that concept up a notch and make sure we had a few brews going on throughout the day. The hubby and I reserved our spot at the brew house for that day on the CHAOS website and then got down to thinking about what we wanted to brew. CHAOS has a newly-formed (yet pretty extensive) barrel aging program going on so instead of coming up with our own recipe, we decided to brew the Elixir of Life, an old stock ale that will be placed in a bourbon barrel. For this 55-gallon barrel, multiple people brew the same beer in order to be able to fill the barrel, one five-gallon batch at a time. There were many advantages of getting in on the barrel fill. First of all, all of the specialty grains, hops, and treacle were provided by brew club co-founder David Williams; we just had to supply the base malt. Another advantage is that we were able to learn something about a type of beer I knew very little about previously. 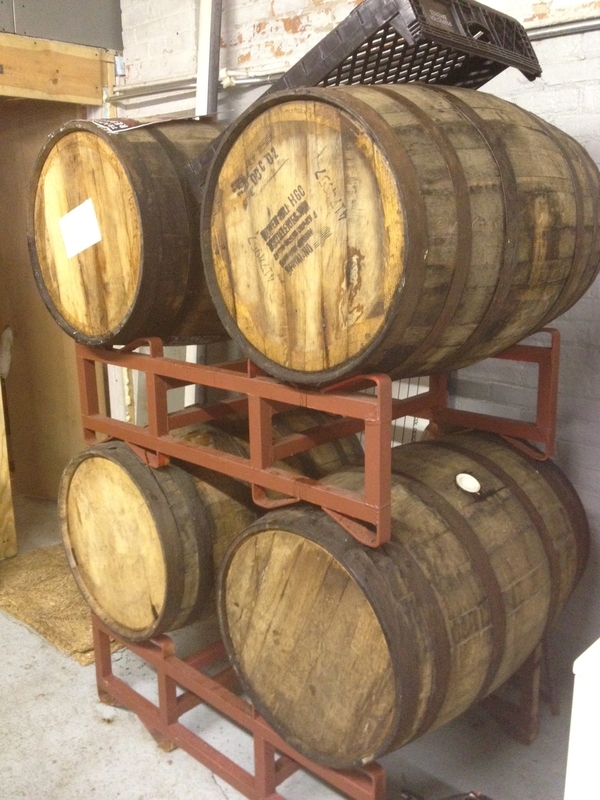 And, when the beer is through with primary fermentation, we will learn how to prepare a barrel for aging beer. How cool is that? This brew day started off as many do: milling the grains, heating the strike water to the desired temperature, adding the milled grains and water to the mash tun. But this brew required a few other steps. After the hour long mash was complete, we had to drain two gallons of the first runnings into a pot and boil it down to a half-gallon syrup. While we were boiling that, we added the sparge water that we had been heating and began the slow trickle from mash tun to boil pot. 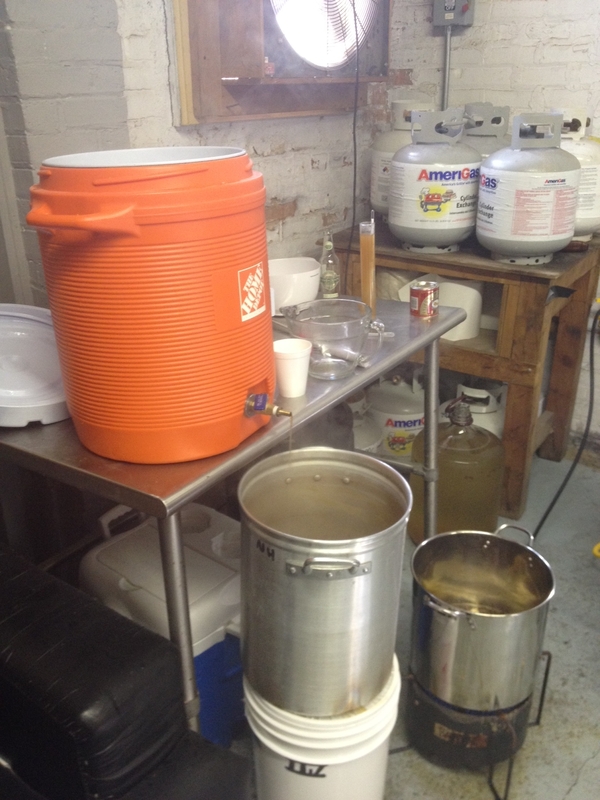 The boil of the first runnings seemed to take forever; I could tell we were in for a long brew day. It was pretty cool to see it condense into this sweet syrup, though. And yes, I took a taste. This would definitely be a tasty pancake topper. You know, if you’re into that sort of thing. After we reached syrup consistency on the first runnings, we added the remainder of the collected wort and started the boil. 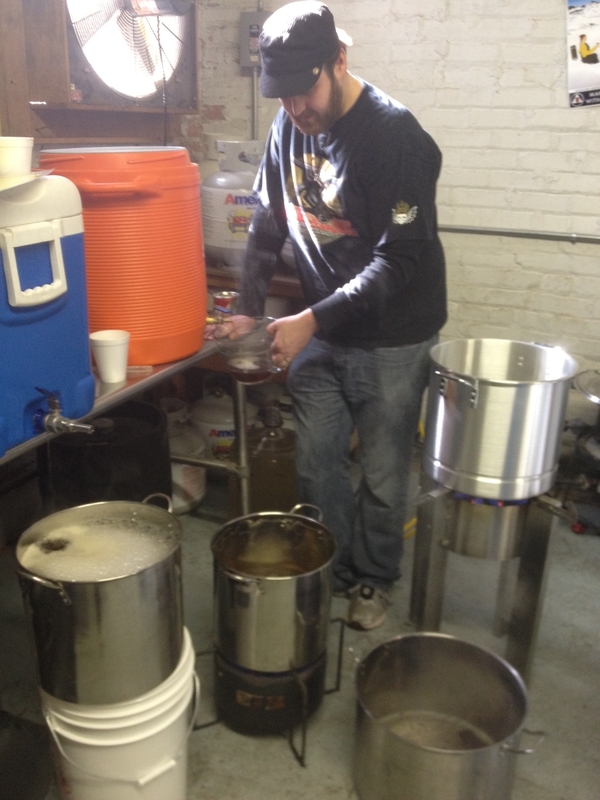 Once we reached boiling, we added the treacle (a British molasses-type concoction) and the first addition of hops. Due to the high concentration of sugar in this beer there were quite a few hop additions, although since this is intended to be a malty beer, they were all on the low alpha acid side (Fuggles and East Kent). The boil seemed to take no time at all, at least when compared to the beginning of the day, and after eight hours our beer was resting comfortably in the CHAOS brew house temperature-controlled fermentation room. While, yes, it was a blast learning about this beer and testing my brewing abilities, the best part was that we had four beers being brewed during the course of the day. It was so cool to be able to discuss the beer with someone else also brewing that beer. We learned tips on how to use our new refractometer and other methods for aerating our wort. You learn so much by just hanging out with other brewers, it’s priceless. The hubby and I have been brewing for about a year and a half, but we do not get to brew very often and we are still learning. It was great to witness someone else’s methods for brewing and have the opportunity to pick their brain. I can’t wait to get out of my tiny kitchen and brew there again! That’s a pretty neat looking setup. I haven’t brewed with a group in a couple of years, but it was always fun to compare and learn different techniques. Hope the barrel turns out tasty! Yeah, it’s pretty cool! If you are in Chicago, you should stop by for our next open house! Cheers! It’s an hour and twenty for me via Metra to get into ‘town’, so it doesn’t happen too often. For beer, though, maybe. Haha, I hear ya. I think we may be doing brew & camp outs over the summer, maybe you can come to one of those!